General Rubber is proud to offer its services and capabilities across multiple industries and sectors. Since 1950 we have been applying advanced materials and technologies, as well as developing custom solutions to even the most demanding applications. The selection and application of expansion joints plays a significant role in system performance, quality, and reliability. Leveraging our extensive industry experience since 1950, General Rubber uses a systematic approach to finding the optimal solutions for any piping system. We believe providing performance replacement expansion joints, and educating our customers, is the best way to ensure the continued efficiency, safety, and reliability of our customers' plants. We provide a plant inspection in combination with training programs developed from over 65 years of experience and installed capacity. General Rubber provides world class technical support through its partnership with its sales representatives, engineers, and distributors. Our factory-trained specialists and field representatives work closely with customers to select the best products and services required to meet the challenges faced by each industry. General Rubber's degreed and licensed engineers excel in creating unique solutions for even the most demanding applications. We lead the industry in custom engineered solutions, using CAD and advanced simulation software to create optimized solutions. We have established a proven history of working closely with customers to implement alliances which reduce costs and increase piping and equipment reliability, as well as improve efficiencies. We are dedicated to educating our customers by providing access to a host of tools, materials, and educational programs to satisfy different industries' requirements. Our training ranges from virtual classrooms to plant walk-downs. General Rubber is committed to excellence, something we have been proving for over 65 years. General Rubber is proud to offer on-site supervised plant surveys and inspections, as well as troubleshooting training and expedited replacements. We can also meet your needs through remote or hands-on training, by making recommendations, or by scheduling plant walk-downs. General Rubber can manufacture standard and custom expansion joints in a wide range of sizes, materials, and arrangements. Our modern, U.S. based and ISO 9001/14001 certified manufacturing facility has a large capacity, allowing us to complete many large scale projects simultaneously. General Rubber is proud to offer a variety of testing capabilities including hydrostatic, vacuum and burst testing, as well as spring rate, movement capabilities, and cycle life and fatigue testing. We are also capable of material testing at ambient and elevated temperatures. General Rubber has spent nearly seven decades designing and manufacturing performance rubber products across multiple industries and sectors around the world. 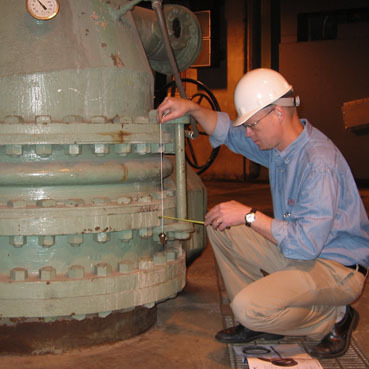 As a result of our significant industry experience, General Rubber is confident in its ability to handle even the most demanding requirements ranging from nuclear safety applications to basic power/process piping requirements.